I was born and brought up in Pune. Being a city kid, going to Kerala for summer holidays meant small adventures with the native cousins, going back to nature and a lot of delicious traditional food. Everyday, there was something new and fun to try out like feeding the goats, cows and chickens, scurrying through the little paddy fields – balancing ourselves on the narrow mud pathways that criss-cross through the fields, and plucking fresh mangoes and cashew apples from the trees. I remember going fishing in the canal waters with my cousins. No fancy equipment or fishing rods. The only gear we needed to catch the tiny flitting fish was a thin cotton Kerala towel. Two of us holding the two ends of the traditionally white towel beneath the surface of the water… watching the fish dart against the white background. Waiting patiently for the right moment… until we were confident that here was an easy catch; lifting the towel up in a single coordinated movement only to find it empty. The fish were often faster than us… then repeating the process again determinedly until there was atleast one prized catch. Those unlucky fish were then transferred into a dirty transparent leaky plastic bag with some water and paraded around town excitedly! The games we were upto as kids! The whole world and all our happiness fit into that little plastic bag with the fish. 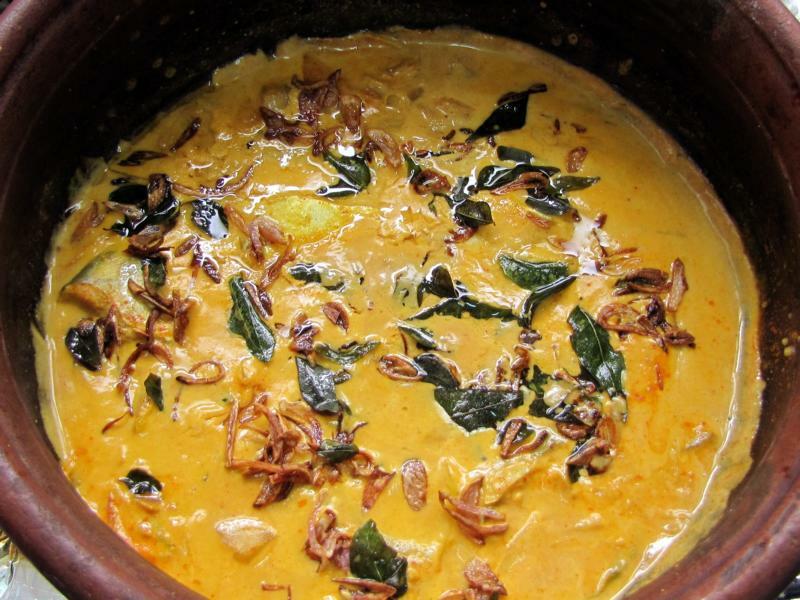 This fish curry brings so many good memories from childhood and Kerala and especially my mother. Normally, I am a big fan of the red fish curry made in South Kerala, but this one that my mother makes has a treasured place in my heart and in my recipe diary. It was an absolute must at family gatherings and special occasions. Everytime I make this, it makes me nostalgic. 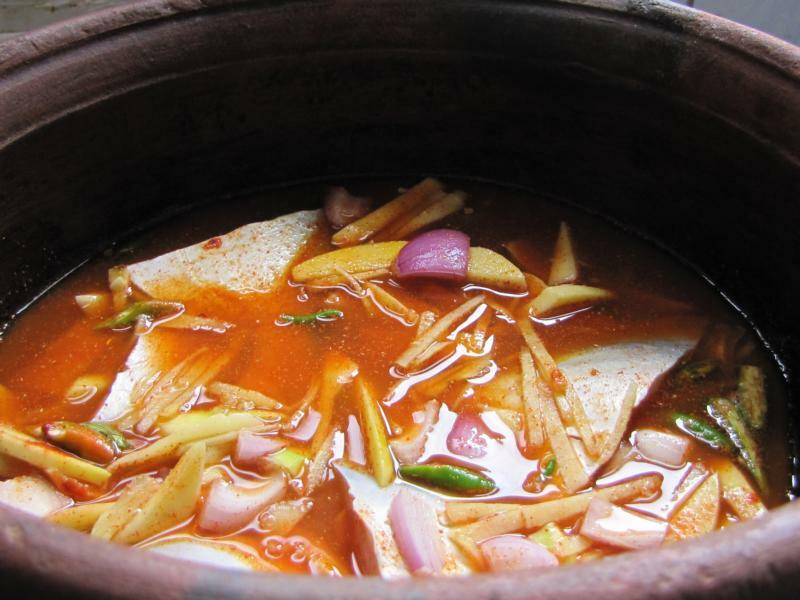 This Fish curry is made with coconut milk. 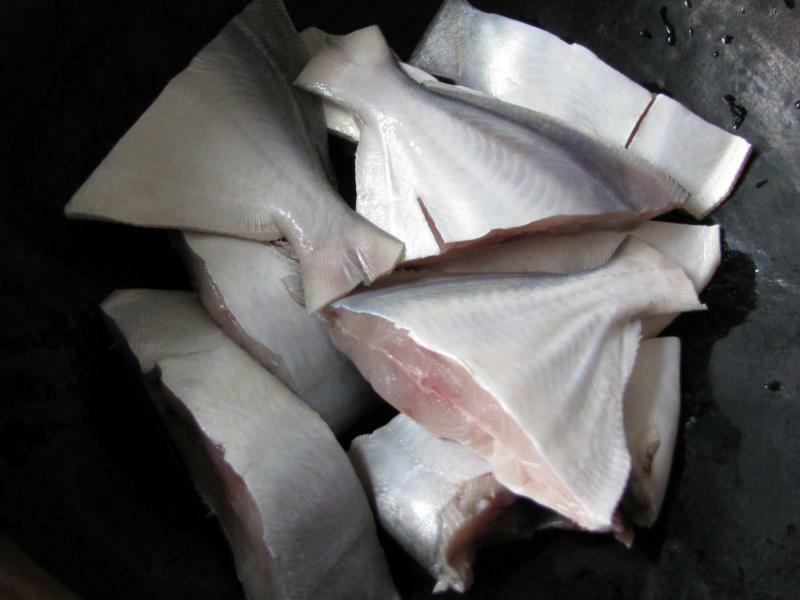 You can use any fleshy, firm fish such as King Fish, black or white Pomfret etc. I used white Pomfret cut into medium sized pieces. 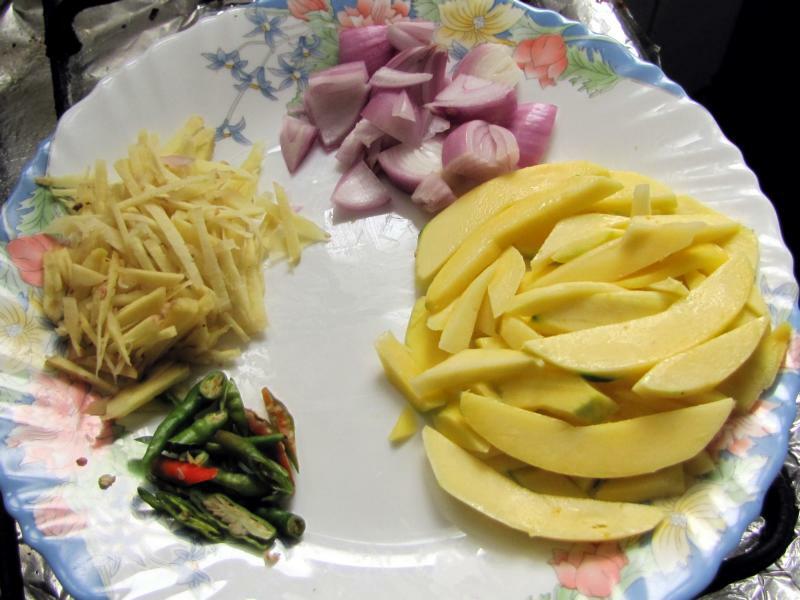 What gives it a unique flavor is raw mangoes – any mango can be used. Test the sourness and use accordingly. 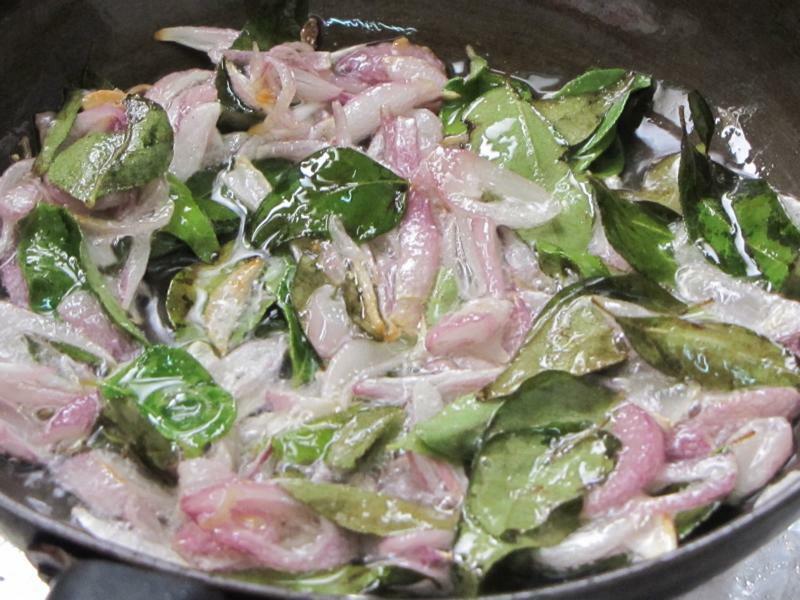 You will also need onions, green chilies and ginger. 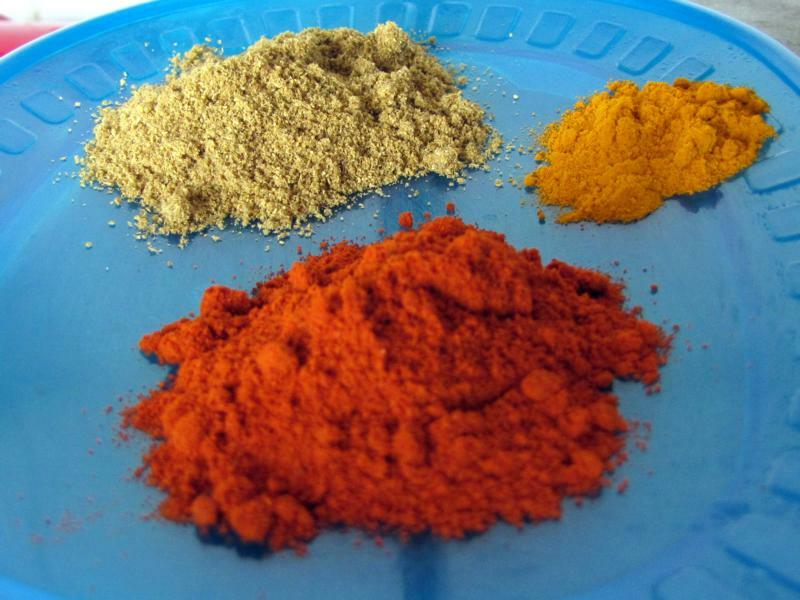 Dried spices used are red chili, coriander and turmeric powders. For the coconut milk, you can use the coconut milk powder which can be dissolved in lukewarm water and used conveniently. If you prefer the fresh version, then grate one whole coconut, grind with 1 cup water, strain the thick milk and keep aside. This is the first milk which will be used in the end as it should not be boiled or it tends to curdle. Add another half cup of water to the used grated coconut and strain again. This is the second milk which will be used initially while cooking. Most Keralites use the traditional mann-chatti – earthenware pan, for typical Kerala dishes. 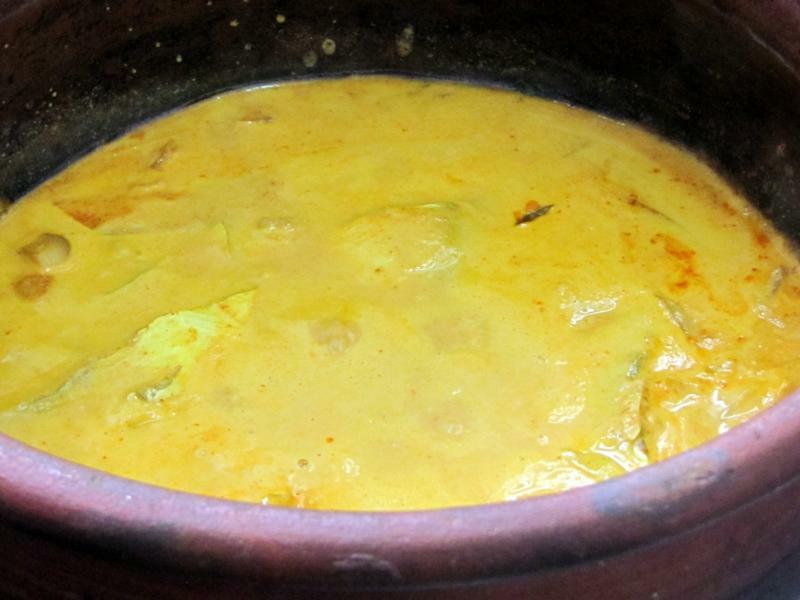 Especially fish is cooked in this mann-chatti as it gives the fish a unique earthy flavor. 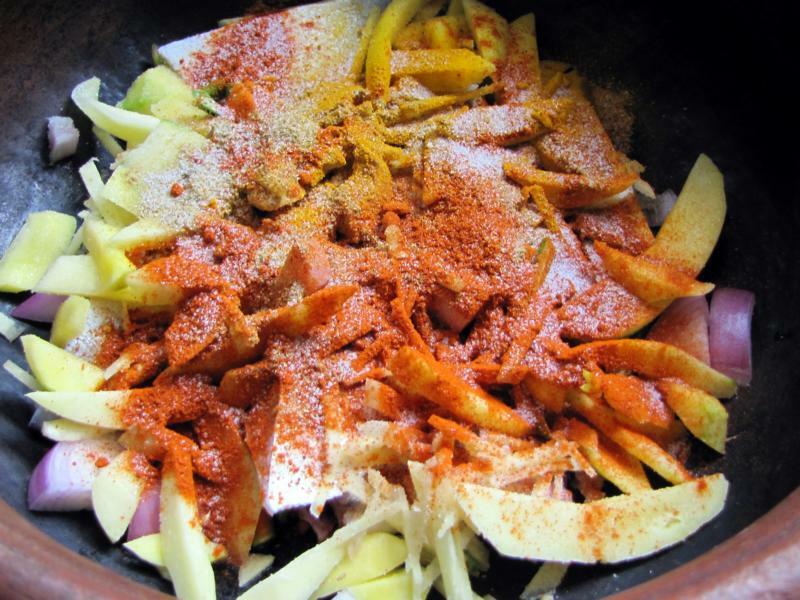 In this chatti, mix the fish with the spices, mangoes, onions, ginger and green chilies. If using powdered coconut milk, cook the above with water. If using fresh milk then cook the above with the second round milk which is thinner. I cooked with water as I was using powdered coconut milk. Make sure that the water is just enough to cover the ingredients and not more. Let it cook on medium flame until it comes to a boil. Continue boiling for another 5 -7 minutes or till the water has reduced atleast to half. If you are using powdered coconut milk, add it now and let it boil for another 2 minutes. In the case of fresh milk, add the thick first milk and switch of the gas immediately. Stir a little. For the tempering which adds the final flavor to this curry, heat coconut oil in a small pan, add Some shallots and fry for two minutes. When it begins to turn golden, add the curry leaves. Pour this tempering over the fish curry and cover the pan with a lid. 1 cup thick coconut milk – made out of 5 heaped tbsps of coconut milk powder. In a mann-chatti or a regular pan, mix all the ingredients for the curry except the thick coconut milk. Add some salt to taste. Add water to just cover the ingredients and cook,If using fresh coconut milk, use the second thin milk instead of water and cook. Let the fish mixture come to a boil and continue boiling for another 5 -7 minutes or till the water has reduced atleast to half. Now add the powdered coconut milk and let it boil again for around 2 minutes. Switch off the flame. 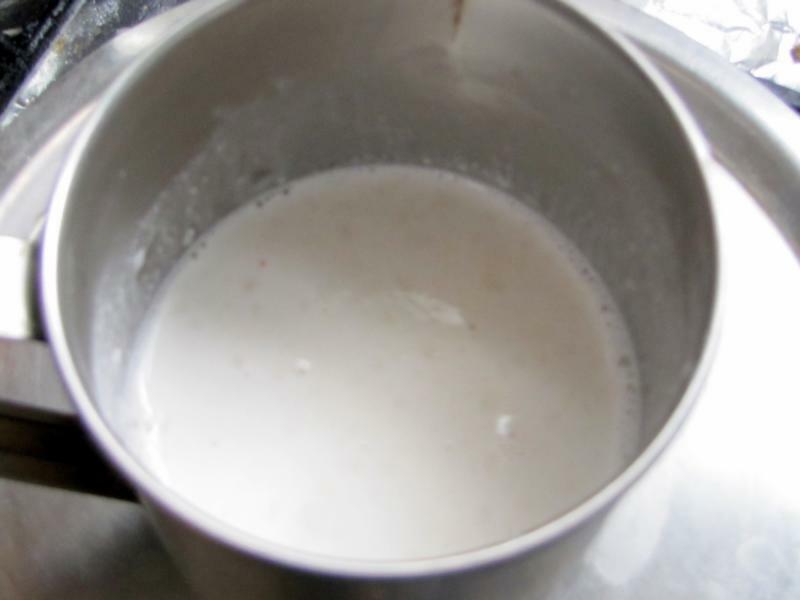 If using fresh milk, add the thick first milk at this stage and switch off immediately. Stir gently. Add the shallots. Fry for 2 minutes. As it begins to turn golden brown add the curry leaves. Fry for few seconds. Pour this tempering over the fish curry and cover the pan. Serve hot with steamed rice. Enjoy!! Tried this fish curry yesterday and absolutely loved it. Made it in a regular pan, as I don’t have the mann chatti… Used Sea Bass, it was great in this recipe. Nice to know u tried this. Hope you try out some more recipes soon.